Biggar Rugby Club ended their BT National League Division 2 season with a comprehensive 55-12 home victory over Preston Lodge on Saturday, writes Alistair Stewart. Biggar’s final league points tally of 613 is currently the highest in the division, with only Kirkcaldy and Hamilton – who each have two games in hand – able to pass this. Conor Lavery opend the Biggar account after just six minutes, a nice show and go flumoxing the PL defence from close range. He added the conversion for 7-0. 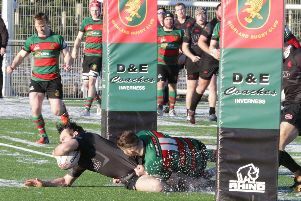 Andrew Orr was again in the van as a ball carrier and his departure to pastures new – he studies in Stirling and is unable to commit the time to travel so will most likely ply his trade at Stirling County next season – will be a big loss. Just short of the 20 minute mark and Biggar added a second try as Robbie Lavery and Rowan Stewart combined well on the left flank to create a simple score for the former. The other Lavery was wide with the conversion. Scrum half Luhann Kotze then burrowed under the PL defence for a fine try, Lavery converting from in front of the posts for 19-0. Winger Ross Bradford then scored the fourth and bonus point winning try, Lavery converting for 26-0. Kotze sprinted away for yet another score and Lavery again did the needful with his boot for 33-0 at half-time. It continued as virtual one way traffic in the second half, with further tries by Calvin Henderson, Scott King (conversion kicked by Guy Hillhouse), Moffat, Robbie Lavery and Rowan Stewart (Bogle converted). Although Preston scored tries early and late in the second period (one of which was converted), they were well beaten. At the end of a very exciting league season, Biggar have accumulated a total of 62 points from their 20 matches. They are currently fifth in the table and have a definite chance of staying there as other teams fulfil their games in hand.